Plexidor Pet Doors: Unusual news: the mayor is a dog. In Boone County, Kentucky, there's a small community called Rabbit Hash. Even besides the unusual name, they have something that distinguishes them from everyone else; their mayor is a dog. You think I'm making this up, don't you? Not at all. There's even a movie about it. According to Wikipedia, it all started in 1998 when a dog named Goofy was elected mayor in an official election. Goofy served the community until 2004, when another dog named Junior was elected mayor. 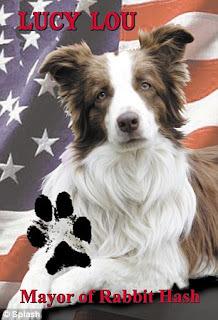 Unfortunately, Junior died in 2008, and was replaced by Lucy Lou, a Border Collie. Lucy Lou is famous for greeting the public, and makes frequent public appearances. She is the third dog in a row to hold the office, but breaks ground as the first female. Lol... unusual news indeed... is that really legal?